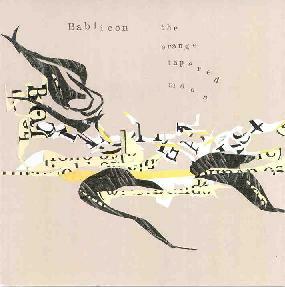 Bablicon - "The Orange Tapered Moon"
Chicago avant-rockers Bablicon return with their follow up to last year's debut, "In A Different City". The band is still Blue Hawaii on electric and upright bass, electric piano, melodica, and voice, The Diminisher on soprano sax, C melody sax, oboe, trombone, electric piano, organ, xylophone, synthesizer, and voice, and Marta Tennae on drums, gongs, buckets, tablas, upright and electric piano, electric bass, electronics, synthesizer, and voice. Phewwww!!! Did you get all that? But Bablicon is adept at fully utilizing this arsenal of noise making machinery and has crafted a set of tunes that run the gamut of avant-rock/RIO, chamber music, freeform jazz, and general sound manipulation. The band claim influences such as Soft Machine, Captain Beefheart, Can, Faust, John Coltrane, Sun Ra, and Albert Ayler. Still prominent for this listener are the RIO-type bands like Art Bears, Aksak Maboul, Thinking Plague, and Dr Nerve that I heard on In A Different City, but Soft Machine, Faust, and Sun Ra are certainly apparent as well. The opening track is "Silicon". The music is like a cross between the Art Bears and Soft Machine, but a more current analogy would be San Francisco band Mushroom, though Bablicon are far more abstract. I love the semi-dissonant but gorgeous violin lines and the Rhodes. And across it's 7 minute length the band gets down to some mucho aggressive freaky avant jazz jams. Another standout is "Anne On An Infibulus", which begins as a free-jazz acid jam (not to be confused with Acid-Jazz). There's a real sense of rhythm here and again things get mighty aggressive as the trio seems to be using all their instruments at once. But this isn't mindless jamming as there's a clear sense of control. The band shifts gears as if starting a new song halfway through, going into a more ambient section consisting of xylophone and various other percussive toys. "An Orange Moon" is one of my favorites being a total space jazz freakout. The band lays down a solid pounding rhythm as the Rhodes jams and all manner of bubbling synths do their manic shooting star acrobatics. Things slow down after a while as the music winds down into a more introspective, but still experimental finale. For "The Well Tempered Alligator" the trio changes course yet again to produce a free-wheeling glom of found sounds, plucked strings, meandering and somewhat whacked out piano, and odd voicings. Think Sun Ra meets Henry Cow. Finally, "210(2)" comes across like Coltrane playing with Henry Cow or some similar avant-progressive band. Again, totally freeform but controlled. The mood is dark but playful and the musicians seem to be having a great time just jamming away. In summary, while The Orange Tapered Moon is stylisticly the same as In A Different City, the band does expand their explorations just a bit further outside the Earth's atmosphere. So fans of the debut disc will not be disappointed by this Sophomore effort. Not for the faint-hearted. The Orange Tapered Moon is distributed by Misra. You can visit their web site. Contact via snail mail at PO Box 20297; Tompkins Square Station; New York, NY 10009. Mail order for Misra is handled through Other Music. You can visit their web site.